Secrets to a Perfect Blowout and Fabulous Hair! Though we can’t all look as beautiful as stunning international recording artist, Katy Perry, we can have just as glamorous hair as she does. With technique, the right products, and a great professional iconic blow dryer like the new ghd air dryer to impart shine and control for the perfect blowout, we too can be on our way to beauty stardom. Recognized for innovative styling tools, ghd rocks just as much as the singer, winning one perpetual beauty award after another since this British company began. 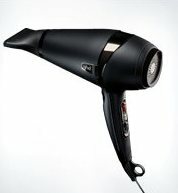 The new ghd air dryer is a culmination of their ten years of expertise that will wow consumers with its performance to outshine their competitors with advanced technology to ergonomic design. Now that you know what you need for beautiful hair, there are some simple tricks that stylists use to turn your hair from flat and ordinary to one full of gleaming bounce and volume as well. Look at your choice of shampoo and conditioner and make sure that they are formulated for your hair type. Just because the bottles are handy in your shower and you borrow them expecting striking results will not happen if the product weighs down your hair or, perhaps, is too light to smooth thick, curls prone to frizz. Instead of grabbing a towel to roughly dry your wet hair before you apply your styling products and blow dryer, think again. This seemingly innocent action can damage fragile hair and cause breakage and a frizz problem. What you can do is press the towel gently to the hair to absorb some of the moisture first before adding some smoothing serum for gloss and heat protection. Avoid reaching for your round brush at this point. A better way is to use one hand to fluff your hair while the other is holding your blow dryer on a medium heat. Those with tons of curls or thick hair may need a higher setting, which is no problem for the variable power and temperature controls of the 2,100 watt ghd air dryer. Keep working and combing through sections of your wet hair, blowing until the area is damp dry and ready for your styling product. Next apply your styling product. All you need is a small amount (about the size of a nickel) to work through your hair. Remember, you can always add more, but too much can ruin your hair with tacky stickiness and turn it flat from a product buildup. This is the stage when it’s safe to reach for your round brush and a few long alligator clips. Section your hair in two places with your clips. Work on the hair around your face first. Release a small amount of hair from one of your clips and tightly wrap it around your brush, pulling down and aiming your blow dryer set on hot with the nozzle attached. Maintain the tension and while the hair is still slightly damp and switch to the cool shot like on the ghd air dryer to lock in the hold. Keep using this technique of pulling small portions of hair from the clip and following the same procedure. As you finish each worked on dried piece, you can gently twist the hair and pin with those long clips. By the time you’re through drying, you can remove those clips to gain some added free-flowing curl. This works best for those with long hair. Those with short hair may want to skip this twist and clip method unless you want an edgy look. Behold, now you know the secret so you can come out of your pond and swim with the big fish to make waves of your own!